For the last two years, I've paused at the beginning of football season to thank the football gods that another season is upon us. Then, I blink and the season is almost over. I look around and it's almost time for the Iron Bowl! What happened? It flies by. So, today, I want to take a moment to dwell in the eager anticipation that precedes the first college football game. Isn't Christmas Eve almost as fun as Christmas? Wanting so badly for something to happen, that you know WILL happen eventually. It's another story if you're unsure whether or not that for which you pine will come to fruition. However, football WILL happen. Thus, I want to record with written word this moment. On the tail end of a long, hot summer; it's about to happen. I flirted with soccer to try to ease the withdrawals (see previous post). But, there's no substitute for the real thing. It begins tonight. Southern Miss against South Carolina at 6:30 CST. A new season of football, a new season in our lives. Bring the cold weather, long sleeves, smack-talk, warm beverages, and ardent cries of WAR DAMN EAGLE! I'm hooked. Soccer is awesome. As you know, I have made an effort to be a soccer fan for the 2010 World Cup. So, I went to a local bar here an Auburn called Quixote's to watch the match this morning at 8:30 a.m. Mimosas and breakfast burritos were flowing and patriotism was high. I felt like a true soccer fan watching a match in a bar in the morning! In the seventh minute, Algeria hit the top bar on a shot that scared us all to death. Later, a Clint Dempsey goal was discounted because we were called offsides, which we weren't. Thus, after 90 minutes of play, the score was still nil-nil. At the time, England was up 1-0 on Slovenia. If those results had stayed, England and Slovenia would have moved on to the round of 16 and we would have gone home. Things were looking grim. The official added four minutes of extra time. In the 91st minute, Algeria made a rifle shot on our goal, but our monster of a keeper stopped it. He quickly threw it out to one of our players in just the right spot. It was then passed downfield and we were on the move! Landon Donovan passed it to Jozy Altidore who shot, but the ball was blocked. As the ball came bouncing out, Donovan smashed it in. The place went NUTS. The country went nuts. All hell broke loose. Beer was spraying everywhere. It was better than an Auburn win. In a split second, we went from going home, to winning our group and moving on. (By the way, we haven't won our group since 1930!) Elation. Pure joy. Check it out. After the initial celebration the bar broke into a rousing rendition of the Star Spangled Banner. It was the "War Eagle fly down the field" of our entire nation. What a cool moment. Go USA!! I've never liked soccer. I was never cool enough to play soccer. I was never athletic enough to play soccer. Why watch or play soccer when there's hard-hitting, high-scoring American football to watch? I'm changing my tune these days. I've made a commitment to be a soccer fan throughout this 2010 World Cup. I'm trying to understand the game and all its weird rules. So, here's a list of things I like about soccer, things I don't like, and ways I would improve the game. 1. The fact that the officials can penalize a team for something... and not even have to tell the team WHAT for. Case and point - USA v. Slovenia. Are you freaking kidding me? 2. The acting. Because they give officials so much power, whenever a player hits the ground they have to whine and cry and grab their face and pretend to be more injured than they've ever been. Dumb. 3. The low scoring. I know, I know, it's just the nature of the game. And I am learning to appreciate the little things (takeaways, good passes, etc.) instead of focusing solely on goals. 1. Time keeps on slippin, slippin, slippin... I like how the clock just runs. You will not have to watch commercials until half time. That's pretty rad. It also speaks to the athleticism of the players that they have to continue playing for 45 mintues! 2. The globality (new word) of it. I'm a huge fan of the olympics because it brings the world together. For those three weeks, most of the world's attention is focused on the games. I always dismissed the World cup. But, soccer truly is a global game that brings hooligans from all parts of the world together. 3. The simplicity of the game. Kick the ball into the goal. Easier said than done, but that's how you win. Done. 1. Coat the ball in bacon grease and periodically release a pack of dogs onto the field. 2. Have "hotspots" like in NBA Jam. If you score from the small circle with a 3 on it, you get three points instead of one. Those are just a few of the ways soccer would be more interesting. I think FIFA will have no problem implementing those simple suggestions. Who Knew There was a Water Park In Auburn? Who knew there was a water park in Auburn? Ok, I knew. But, I thought it was like trashy, run down, gross, dumb, nobody goes there water park. Turns out it's none of those things (except for the nobody-goes-there part). With the summer off, some coworkers and I decided to get season passes to Surfside water park. It's pretty rad. There's a wave pool, a lazy river, six slides, and delicious chili-cheese dogs. We got the "family package" so it was a much better deal. We spend our afternoons sliding, floating, and generally lazing around the water park. On a crowded day, there may be a two-person wait for the best slides. On an average day though, there are as many lifeguards as patrons of the fine establishment. What a hidden gem in the sediment that is Auburn. In 2nd Samuel, a man named Benaiah is in the woods on a snowy afternoon. He spots a lion. Most of us would wet ourselves, then run. Not Benaiah. He charges the lion and the lion runs! Benaiah gives chase until he comes upon a deep pit. He walks up to the edge, looks down, and sees two huge yellow eyes staring back at him. Benaiah turns from the pit and walks away. However, he's not walking away for good. Instead, he's getting a running start. He leaps into the pit with spear in hand to kill or be killed. After several minutes of roaring, grunting, and screaming, Benaiah climbs out of the pit. I bought a book yesterday called In a Pit With a Lion on a Snowy Day by Mark Batterson. I thought I was done with these Christian self-help, inspirational books. However, something about this one peaked my interest (and it was only five bucks at the Cornerstone bookstore). I've read four chapters and am loving it. It's not NORMAL to chase a lion into a pit and try to kill it. God doesn't call us to sit by and be normal. The lion represents our seemingly insurmountable fears, and the only way to overcome that fear is to face it head on. That defies all that is within us though. Our rational minds say, "Are you crazy? I'm not going into that pit after that lion!" But it's an integral part to becoming who God wants us to be. Imagine you are on a boat in the middle of the ocean. You've never really sailed before, but you thought it'd be fun. You ask your captain, "Have you ever been in a storm before?" Wouldn't you feel much better if your captain's response was "Yes, I've weathered many storms at sea" rather than "Nope, never sailed in a storm before"? The adversity makes us better, stronger, wiser. So this image of a lion is stuck with me right now. It represents those fears that we normally would run away from, but God is calling us to chase, charge, and kill. I like that. I like the thrill of overcoming a fear. I've been wanting a tatoo for a while now. I couldn't ever think of a phrase that I would want on me forever. But a picture is worth a thousand words. I think I want a lion tatoo. 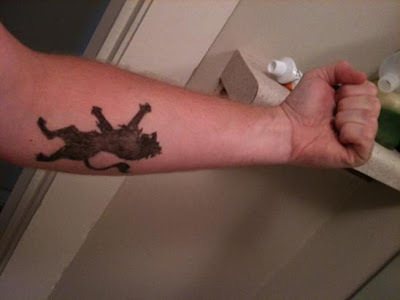 So, yesterday I drew one on my arm just to see what it would look like. I would probably go about two-thirds that size. It's called a "rampant lion" and it was used in medieval times on shields and crests. We give lions so much respect because of how much we fear them. Our fears in life don't deserve that much respect. They can rule us if we don't chase them down and defeat them. The thing to remember though, is that we don't fight them alone. Our God is fighting alongside us. Things have been crazy around here! I'm sure you've been busy too. In the last few weeks I've put on four performances of our Spring Show "Willy Wonka Jr." and had two choir concerts. I've also been up to my eyeballs in paperwork for our spring trip to Atlanta. Most of the time I like being busy, I feel like I work better and harder when I'm under the gun. However, it was nice to get home at a normal time yesterday and be able to have a life after work! Here's a thought (totally seperate from the above statements) that I've been pondering today: If we all know and understand that nobody is perfect, why is it so hard to accept when we fail or do something stupid? I'm not saying we should just be ok with messing up, but why is it SO difficult to admit when we're wrong and apologize? Is it pride? Are we too prideful to admit that we messed up? I'm trying not to be. Derek Webb once said that the greatest thing that could ever happen to us is for our greatest sin to be broadcast on the 5 o'clock news. Scary thought huh? But maybe he's on to something. If everyone knows the depths of everyone else's struggles, weaknesses, and failures, maybe we would be more inclined toward understanding and forgiveness. I'm not a great person that screws up every now and then. Rather, I'm a screw-up that gets things right every now and then. Hello? Anyone there? Does anybody still read this? I sure don't. Anyways- if you happen to stop by and read, I'll write some things just for you. Life right now is grand. I'm (generally) happy at my job, there's an extra hour of daylight every day, I attend a great church, I've been lifting weights (to get swole for warrior dash... which is a topic for another post), my car runs well, my dog runs well... life is good. Rehearsals for Willy Wonka Jr. are in the stage where they are actually fun now. Don't get me wrong, they are still work. However, I enjoy it. I actually look forward to it. I don't mind that it keeps me at school until 5:30 or later. The kids know their lines. The props are coming in. Costumes are getting finished. The set is being finalized. Things are coming together and I'm really excited! We bought our own lights and they came in today! In the past, we've rented them for just a little less than it cost to buy them. So, we bit the bullet, did a fundraiser (talent show) and bought them! Let there be light! If you're in the Auburn area (or even if you're not) on April 13th, please come to Drake Middle School to see our production. These kids (and teachers) have worked SO hard!! Easter. Of all the crazy things in the bible. He died. His enemies sat back and laughed, washed their hands of him. Then, our God raised him from the dead. BAM! In yo face. If I had to pick one event from the bible to actually witness, it would be His resurrection (well... if I'm honest with myself it would probably be his crucifixion. I daily need to be reminded that it was MY sin that he took upon himself... and also MY sin that he overcame and MY life he died for). But... in terms of sheer AWESOMENESS... resurrection all the way. I would freak out. So, count your blessings this week. Including, but not limited to, the fact that our God has a plan that we cannot even fathom. Crazy ole Yaweh... what'll he do next? SWM. 25. Auburn, AL. Music/Choir teacher. Musician. Believer. Must enjoy the sun. Must enjoy the sea. in this life of mine.. I've Moved! - I'm moving over to WordPress. All these posts (including the new one...read it) are over there now. wchandlerparker.wordpress.com Thanks for reading.